His involvement with the dictionary ceased in 2003, earlier than he would have preferred; Karanastassis went back to his dissertation (which we hope to see published soon), and his research. The dictionary has gone on without him, and I wish it well; but it will not soon see someone with that degree of immersion, dedication, and easy familiarity with half a millenium’s worth of words. A familiarity, I am told, that translated into 4,000 marginal notes to Trapp’s overlapping Lexikon der byzantinischen Gräzität. I hope they too will eventually see the light of day. I profited from his easy familiarity while George Baloglou and I were translating the Entertaining Tale of Quadrupeds: more than once during our inquiries he’d pause, look up, mutter “that can’t be right”, walk to the shelf, and fish out a novel sense of στασίδι from a six-hundred year old legal deed. (“Fishing spot”, not “pew”—teaching me for the first time that Early Modern Greek was not as like to the language I speak as I’d assumed.) He had volumes of facts and contexts and connections filed away in his head, in a heterogeneous throng like the jars of pencil stubs and pottery shards he kept by his desk. And he always delighted to gather more: my unconscious lapses into Cretan phonology (δεκαρά), as much as mediaeval words for saucers (σαρσαρόλι). That delight is what made him the dictionary’s soul and its motor, as its thrall. He had objected to me saying as much about him on my web site, and he deferred to his forebear. 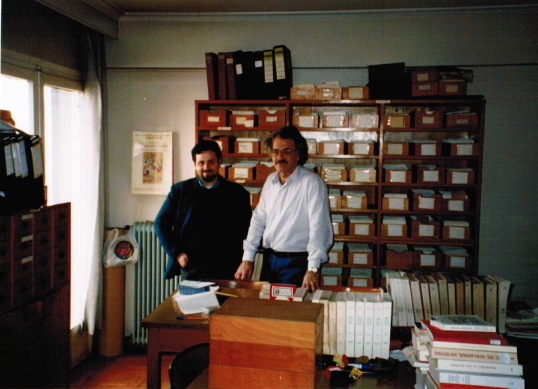 (He was mortified when I guffawed at a paper I was reading on the premises in ’96: “Shut up, the Professor is inside!”) But Karanastassis has a large share of the responsibility for Early Modern Greek now having a dictionary. And his contribution has not been adequately acknowledged. His name does appear on the cover of the 2001 abridgment at least; but the whole dictionary is his, as much as it is anyone’s. And that deserves to be said more. George knew him longer than I did, and has put up his own reminiscences of him, more detailed than you’ll find here. I’m glad to know Tassos stopped by this blog from time to time, even as his illness started to take its toll. I smile to read he had smirked to George about the same obscene citation from 1383 that I posted about last month. But by last month, Tassos was no longer able to stop by and smirk once more. For my part, I pause at an image, and at a put-down. Someone once groused at me, “Karanastassis thinks he’s labouring sub specie aeternitatis.” That wasn’t intended as a compliment. But while I was gratified by Tassos’ excitement when he solved a problem, or his good humour as he told a story entirely too long, the image that abides with me is Tassos labouring “under the aspect of eternity”: pensive with his melancholy mustache and shock of grey hair, his blue eyes staring into the distance, sorting through words and facts and contexts, bringing them into deliberate, and unrushed, order. He is eternity’s now. Ελαφρύ το χώμα που τον σκεπάζει. Light be the earth that covers him. NB: Tassos Karanastassis is not to be confused with his namesake Anastasios Karanastassis, another Greek lexicographer, who wrote the Academy of Athens’ Dictionary of the Greek Dialects of Southern Italy. Thank you Nick, for your heartfelt tribute to my brother. It pains me too to think of the loss of his scholar identity, together with the varied talents he was endowed with; his ease with Math in high school, his sketching ability, the meticulousness with which he and his brother built model airplanes, his skill in photography — adolescent or adult talents that fell by the wayside as he got more and more immersed in his academic endeavors. But all that doesn’t compare to the grief I feel for the loss of his goodness, expressed equally to those around him, from the professor you mentioned, to the family of gypsies overflowing to the yard of their little house in his neighborhood, or a dog he’d run into during one of his walks. I hurt for the loss of his child-like innocence that left him vulnerable at times and because of that it saddened and angered me. Struggling to come to grips with his harsh path to death, I’m trying to console myself with the hope that he is indeed at a “place” far better suited for his gentle kind.